A tribute to the gay rights campaigners who paved the way. 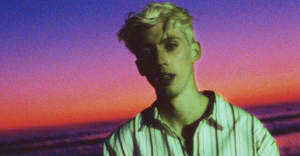 Troye Sivan has shared a moving video for his single "Heaven" featuring Betty Who. The black and white clip shows Sivan performing the song in the rain and while being held in an anonymous man's arms. This is then cut with archive footage of gay rights protests including clips of Harvey Milk, and from the ACT UP protests of the '80s and '90s. According to a rep, Sivan was originally going to release the video tomorrow, January 20, to coincide with Donald Trump's inauguration. However, he brought it forward a day due to an overwhelming response from fans to teasers for the clip. "Heaven" features on Sivan's debut album Blue Neighbourhood. Check out the video above.